The Zoor Pod System is a cutting-edge All in One closed pod style vaporizer from 7 Daze that utilizes a convenient draw activated firing mechanism, making it perfect for beginners. This cutting-edge device is designed with a plug and play cartridge pod system that makes replacing pods a quick and care-free process. Once one is emptied you can use just two fingers to remove it from it's housing and lock a new one into place in just a matter of moments. 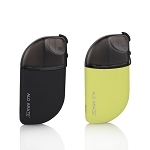 7 Daze's Zoor can only be used with the Zoor brand pod pre-filled pod cartridges. These pods hold up to 2mL of liquid with a 50mg nicotine strength and your choice of flavor including Cake, \Apple, Mint Ice, Sweets and a Mixed pack option. Each pod is equipped with an advanced wickless ceramic element that will deliver a quality of flavor like no other device in it's class. The Zoor is manufactured with a sleek and compact shape that offers the looks to match the great performance. 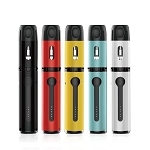 Although it is one of the smaller vaporizers on the market, it is stocked with a large 500mAh lithium-ion battery that will deliver days of use between each charge. Whether you are just getting into vaping or have been at it for years, the Zoor Vaporizer from 7 Daze will deliver just the results you are after.